Plot Summary: Magic is what makes the fictional world of Earth-land go 'round, and its many mage guilds work together—or sometimes against one another—to bring balance to that world. Each guild flaunts unique features in hopes of being the best guild on the planet. Lucy Heartfilia, a 17-year-old girl, is desperately searching for the perfect guild. After running from her father, she wanders the city in search of Gold Keys, for they unlock the Celestial Spirits that are so vital for her magic. With so many wizards around, it's a journey that's very challenging and dangerous to go alone. 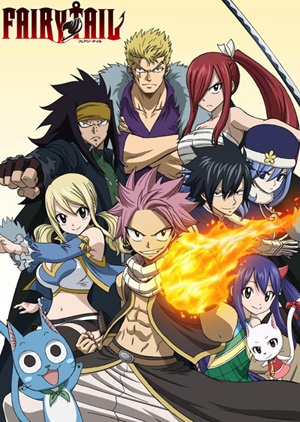 Yet a fateful encounter with Natsu Dragneel (a wizard who largely resembles a dragon) leads her to a guild known as Fairy Tail, which soon becomes her new home. Her happiness amongst new-found friends is overshadowed by the evil powers of malicious guilds and the mysterious dark wizard Zeref. Their lives are about to take an unexpected turn as they battle evil, fight for their guild, and uncover fragments of their past. It will shake the foundations of who they are as people, and help explain why Earth-land has fallen into this state to begin with.